Hide.me VPN Review - 5* for Privacy & Speed, but Only 4* Overall? Hide.me VPN is based in Malaysia and has been created with input from IT experts from around the world. The impressive tech team boasts security experts formerly associated with multinational corporations and governments, so they know their game. Hide.me prides itself on being one of the most secure VPN providers on the market. 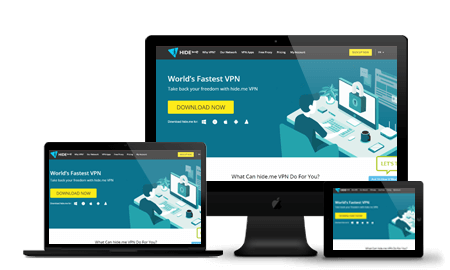 Relatively new to the VPN market, having launched in late 2012, the provider has emerged as one of the top VPN services thanks to its superb security, privacy, and access to restricted online content. Hide.me VPN services come in three different plans: Free, Plus and Premium, each offering a different level of service. The free package provides all the main services with a stripped down capacity. It’s a great way to test the quality of the service. But if you’re serious about security, then you’ll want to invest in one of the paid subscriptions. The Premium plan (the plan with the most features) is worth committing to, as it allows 5 simultaneous connections and unlimited data transfer limits for $9.99/month. The less expensive Plus plan starts at $4.99/month, but you’ll only get 75 GB data transfer and 1 simultaneous connection. But with both plans, you get a high-quality service and a 14-day money-back guarantee. There are also options for plenty of popular payment options as well as Bitcoin, so you can really stay anonymous. Hide.me hasn’t skipped out on features, especially when it comes to security. This VPN service offers more security extras than most others, so users can maintain full control of their privacy. Hide.me’s VPN is loaded with incredible features that are easy to utilize and provide a whole new level of trust and peace of mind. The free proxy plan supports popular protocols such as PPTP, L2TP, IPsec (IKEv1 and IKEv2), OpenVPN, SoftEther, SSTP, and SOCKS. If you’re a premium plan user, then you can access torrents. Hide.me’s premium plan users port-forwarding for faster speeds and no throttling when using torrenting. The Hide.me VPN has been built to never log any user’s browsing activity and information. Not only that, Hide.me doesn’t hold any customer’s IP address, phone number, name or other personal details. It simply only keeps a record of the email address of the user. The Hide.me service even offers a free proxy browser for all their customers. The proxy service enables users to access geo-restricted sites anywhere in the world. Hide.me VPN also gives legal users access to global TV and videos from the likes of BBC, HBO, Netflix, Hulu, and other popular streaming sites. Hide.me supports Windows 10,8, and 7, Windows Vista, Windows XP, Mac OS, Linux (Ubuntu), Ubuntu 14.04, Fedora 24+ iOS for iPhone and iPad, Android, Windows Phone, and Blackberry. Hide.me was certified completely log-free following an audit by Leon Juranic of Defense Code Ltd. Users never have to worry about data transfer logs or any privacy infringements on their online activity. Hide.me has strict “no third parties involved” and “no alliance or association with Five Eyes countries” policies that are reinforced thanks to their P2P file sharing option. Because the company is based in Malaysia, it does not need to comply with foreign privacy laws. Hide.me has even started publishing a transparency report of requests by authorities for information on users of their service and their responses, which simply say it does not keep logs. The Hide.me VPN service also boasts an unusually large number of protocols. With so many choices, the user can pick the best protocol for speed and security. We’d recommend OpenVPN or IKEv2. because these use the very secure AES 256-bit encryption. This highly secure VPN provider also offers dynamic port forwarding, which is a more optimal security solution than exposing ports of the customer’s device. The main form of customer support is via a ticket-based email help system. Users can expect swift replies, even at weekends, and the support response is very helpful and easy to understand. They have also recently implemented a live chat support feature, which is usually the most popular method for customers to get in touch. However, they only provide support in English. The Hide.me website features a number of tutorials, as well as a basic Frequently Asked Questions page which explains the most common customer issues. A community page forum where the Admins and developers are very active is also another good source of info. Overall, the support is pretty good, but you can usually find the solution to a problem without having to contact them at all. The forums are that good! One of the stand-out characteristics of Hide.me’s service is the speed it delivers – it’s truly fast! These impressive speeds are only available with the paid subscriptions. Users can expect a smooth streaming and downloading performance, making Hide.me a great VPN choice for torrent hounds and Netflix lovers. The speeds are more than satisfactory across all operating systems and devices. The free proxy that Hide.me provides to all their subscribers is even fast too. We didn’t come across any problems or any downtime issues with this VPN. It really does impress when it comes to the speed, reliability, and bandwidth. TheHide.me website is simple, with a sleek design and effortless navigation. The website provides easy-to-use setup guides that make it a breeze for users to get up and running. All customers need to do is install the basic client software, and then they can get connected to the VPN network and start enjoying safe and secure web activity. The client software is designed for ease of use, putting the VPN server locations right in front of the users for easy selection. Hide.me offers manual VPN connectivity for all operating systems. The OpenVPN protocol is easy to install. Keep in mind that there are different protocols for a manual connection, such as PPTP, L2TP, IPSec, Cisco IPSec, or IKEv2, which can deliver a variety of results. Hide.me VPN really stands out, as it offers a truly anonymous internet connection. It gets top marks for security, protocol, and speeds, which is the core of any VPN service. It’s probably the very best on the market when it comes down to security. The only downside is that the premium plan could be considered a little pricey. But if you’re really security-conscious, then it’s definitely worth the price.